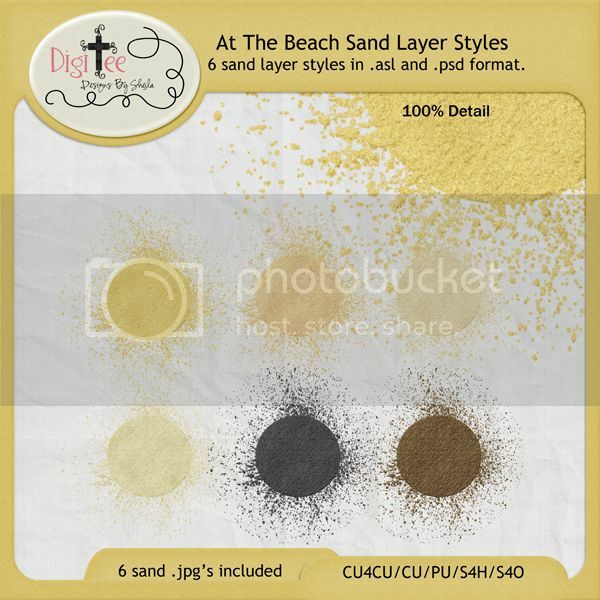 DigiTee Designs By Sheila: CU4CU AT THE BEACH SAND STYLES FREEBIE! I am super excited and I hope you like them as much as I do. And stay tuned for the next layer style I was off to make, the WATER style!!! It will be added in my next beachapaloosa post:)lol! Thank you so much Sheila for sharing! I am hoping to participate in the train! These are FANTASTIC! How did you know I was grumbling and desperately looking for sand styles the other day? I am a style addict so this makes me extremely giddy-happy! You are awesome to create all these beautiful things and share them so generously with all of us. I want to be JUST like you when I grow up! Thank you, Sheila! Thank you! - great styles!! Thank you so much for sharing your talent. I just downloaded several of your CU freebies. Love this sand style! Thank you! I love styles and can't wait for the beach BT!! Thank you so much for these great styles! WOOHAH! This was just what I needed to finish up my add-on pack for the Pixelscrapper August Blogtrain. Thank you so much for doing all the hard work for me Sheila! I love you to pieces right now!! Thank you Shelia. These will come in handy. Looking forward to seeing your finished kit. I really appreciate all of your beach related styles. Thank you! Thank you so much for making these...just fantastic! These are so cool. Thanks so much! I've just grabbed all the beach items. Thanks so much. Sorry I can't leave comments on each but with word verification on it just takes too long. I'm off to grab you PS collaboration now. These are awesome, thank you so much! I wasn't going to participate in the blog train this month but I'm getting super inspired! Thank you for this set Sheila - perfect for an upcoming Steampunk Mermaid project! WoW! These are great! You are such a hard worker and your hard work paid off in a beautiful product. THank you for sharing with us. These sand styles are awesome! Thanks for so freely sharing the results of your hard work.